Lisa Snider: The Edible Eden: A West Ventura twosome shows how to use permaculture to grow one bountiful garden. 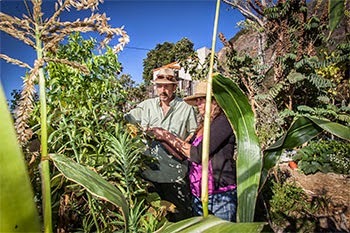 The Edible Eden: A West Ventura twosome shows how to use permaculture to grow one bountiful garden. Photo by T Christian Gapen. Permaculture is a really big word for a remarkably simple concept. Ever since college, edible landscaper Eric Werbalowsky has been spreading the gospel of permaculture to anyone who will listen. A self-described compost evangelist, Werbalowsky has been both a consultant and an activist when it comes to creating landscapes that nourish both body and soul. Last month, he once again gave his time, energy, and design expertise at the Ventura County Fair, with his floriculture exhibit showcasing Ventura Growing Circles—a burgeoning organization that promotes neighborhood food growing and sharing—and he took home a few blue ribbons, too. When he is not busy with his day job consulting, he volunteers for Ventura County Surfrider Foundation’s Ocean Friendly Gardens initiative, which promotes eco-friendly landscapes, and he spends time at the Bell Arts Factory mentoring young would-be gardeners through the Kids Garden Brigade. Permaculture is about being in relationship with our environment, our community, our natural landscape, and our human-created landscape, and asks, “How do we use these systems with minimum input and run them as much as possible with sustainable resources?” You can design how you live so that it creates abundance instead of a burden. When I was going to UCSB in the early ’80s, I took a course in food and ecosystems. I experienced this intense sense of “Oh, my God. What can I do?’ That’s when I began understanding what composting was. I learned to make humus. I learned to grow food. It was so simple and so basic, and it was part of a solution. It really felt positive. We’re in a drought. How does permaculture address that? Everybody is sticking their straw in the ground and taking, taking, taking. Permaculture addresses that and says putting running water down the drain isn’t where it’s at. With increased drought awareness and rising water rates, customers are asking for water-wise landscape renovations—replacing turf with mulches, installing laundry-to-landscape greywater systems and adding interesting motifs like dry creek beds with climate appropriate plants, especially California natives. Taking care of existing fruit trees, adding new ones, and making compact food beds are often an integral part of this work, too. As an edible landscaper, it's a little embarrassing to admit, but my new favorite garden features are well-placed rocks. I especially like the way they provide rhythm and strong texture to any landscape. We usually complement rockery with accent plants to take advantage of the microclimate benefits they can provide. Would you say permaculture takes a lot of work and money, or is it good for those of us who tend to be lazy and frugal? Permaculture design takes more thought than work or money. In fact, the basics of permaculture involve placing design elements so that as they grow and become more established, less work and inputs, including water, are required. It may seem esoteric at first, but when we can create a design that uses a site's natural energies of wind, sun, rain, animals, and plants, we can mimic the way natural systems become richer, more complex, and more productive over time, like a forest. What’s unique about our area as it pertains to permaculture? We have a number of climate zones in Ventura County. I can grow lettuce year-round, but a couple miles inland, no way, unless that climate is moderated in some way. Because we are in a Mediterranean climate, which is mild year-round, we can grow most things. If you like food, this is an amazing place to be. How can a first-time gardener get started at home using permaculture without being intimidated? Start really, really small and really close. There is an axiom that says you will eat whatever is closest to your kitchen door. Put a small garden right there in the ground or in a box. I have a small grow battery and I’ve been eating salads out of a little box on my patio. When we’re eating dinner late, I don’t have to put on a headlamp and go out back. It’s so easy to start small because it won’t be overwhelming. It’s also a great way to avoid some of the common pitfalls of gardening. What makes permaculture such a valuable tool is that it is always a product of specific local observation, followed by a design to create a result or “yield.” Permaculture design always employs a strategy—even the simple idea of placing garden beds or planters close to areas that get a lot of attention, like along our walkways and near the kitchen door. Despite the relative luxury of home garden space on our hillside, I often harvest herbs and greens from my grow batteries just like a condo balcony gardener because they are visible from my kitchen window, and so easy to access when making meals. What vegetables are you most excited about harvesting from your garden this fall, and what is your favorite way to prepare them? My partner, Kiki, has been working more traditional crops into our gardens, like beans for drying and corn for making masa. It does simplify harvesting to not have to guess at ripeness because we let these crops fully dry on the vine or stalk before harvest. I haven't really been into dry bean cuisine before, but I really appreciate the noticeable flavor complexities and sweetness of our Cherokee and Black Turtle beans. We will ferment the corn in preparation for creating the masa meal. It is a lot more work than eating fresh corn, but it is a delicious upgrade on most commercial masa and tortillas. Do you have any seasonal tips for at-home gardeners this fall? Yes, make your beds! After a long spring/summer season it is easy to cut and run—to just leave/ignore faded mulches and crop stalks. It doesn't take a lot of extra effort to lay on a thick mulch of rough compost, dried grasses, or wood fines. It will protect the organic matter in your topsoil from both the sun and rain. Ideally, all dirt, even in pathways, will be covered under a mulch blanket of at least six inches. By using finer materials that break down more quickly than larger wood chips, it will also add nutrients while the garden bed awaits its next use, whether that’s food, flowers, a cover crop, or left fallow.